Sometimes, you just need to barbecue some pork. There’s nothing clever about it, it’s just a juicy, richly spiced grilled pork loin. 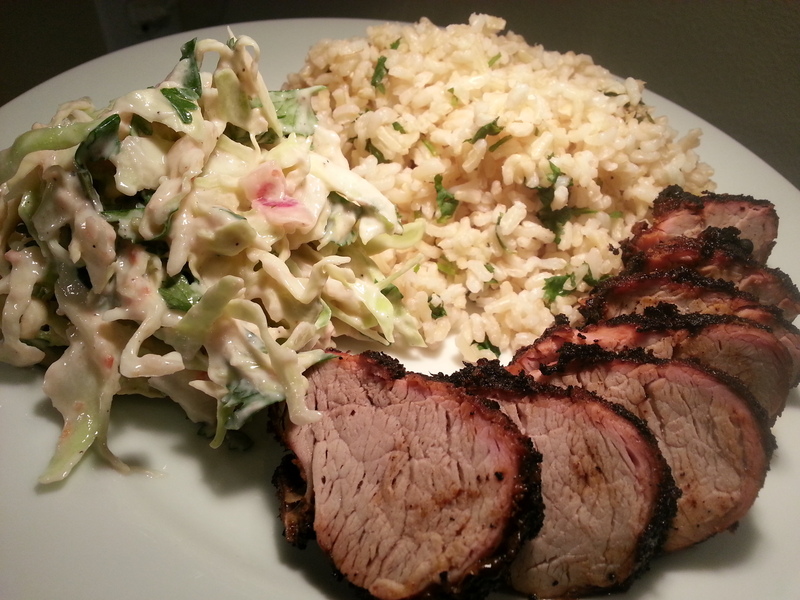 I served this spicy grilled pork tenderloin with my favorite salsa slaw (made with my newest fresh salsa) on a bed of cilantro-lime rice. Mix the sugar and spiced together, and rub the spice mixture on the tenderloin. Preheat the grill on medium-high. Grill the tenderloin for 8 minutes, turn once, and grill for an additional 8 minutes. The timing works best if the tenderloins are relatively the same size. The sugar in the spice mixture will create a nice char on the outside of the tenderloin, and lock in the moisture and flavor. After the total 16 minutes (or so) of cooking, turn the heat off and let the tenderloin sit on the cooling grill for another five or six minutes. Remove the tenderloin from the grill, and slice to your desired thickness. For the rice, cook it according to the package directions, and then toss it with the cilantro, lime, salt and pepper. Quick and simple!